Craftin' Caro: Preview Brochure Goodies are IN! Preview Brochure Goodies are IN! Can I hear a "woooohooo?" What better way for me to celebrate (almost) finishing our business taxes for the year than a great big honking box of Stampin' Up! goodies for me? Yes, I went haywire and ordered everything I wanted from the new Preview Brochure and it's ALL HERE NOW! 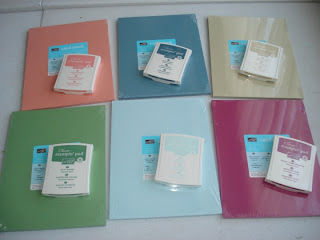 I ordered all 6 new "In Color" paper and ink pads... Groovy Guava, River Rock, Purely Pomegranate, Soft Sky, Bayoo Blue and Wild WASABIIIIIIIIII. I thought this past year's "In Color" selections were pretty awesome, and I wasn't sure that anything could replace my fondness for Cool Caribbean and Crisp Cranberry but now I'm not so sure... it's going to be a joy planning out my Hostess Appreciation event projects with these sweeties! 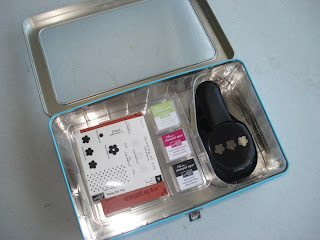 Of course I *needed* the new Punch Box kit with the 3 little ink spots, 9 stamps (die-cut!) and triple flower punch. I saw so many gorgeous little cards made with this while on the Panama Canal Cruise (see here) that I knew it would be a top priority to get in my hot little hands. And now it's mine, all mine (insert evil wicked witch cackling). 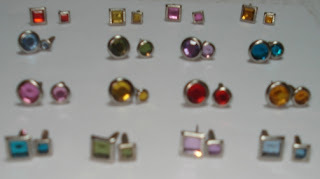 I also ordered all 4 packages of new Rhinestone bling brads -- yes, I now have 32 different kinds to play from. I'll be giving these away FREE with my next big upcoming promotion -- if you're Canadian and signed up for my e-newsletter, you'll hear all about it on the 20th (unless you ask me nicely and I'll give you the scoop earlier)! 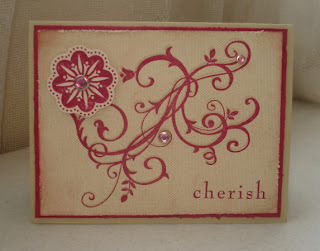 - phenomenal new 12x12 designer papers, that I'm fairly drooling over. Let me know if there's ever anything you would like me to showcase here on the blog. Leave a comment below and I'll do my best to accomodate you! I LOVE Baroque Motifs and cannot wait to get it in my little hands! Your sample is gorgeous! Caroline: I love Baroque Motifs too! I got it because of your medallion post...the ladies on SCS were talking about it and that's when I discovered your blog. You are very creative. I enjoy seeing what you are up to everyday! Keep up the good work! WOHOO!!!! Now I wish I got all the new colours too!! !